Detailing a mysterious realm that’s as vital to our existence as the air we breathe, this new atlas immerses readers in the wonders of the deep through more than 250 up-to-the-minute maps, photographs, and satellite images. 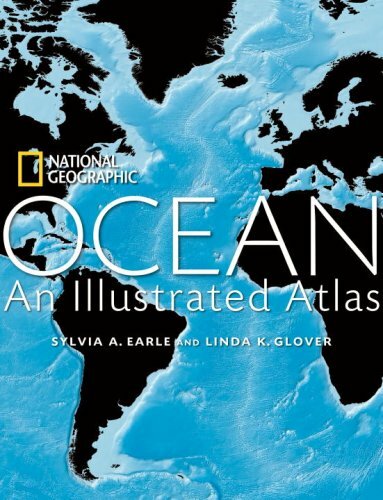 Deep-sea pioneer and National Geographic Explorer-in-Residence Sylvia A. Earle (known as 'Her Deepness') and marine scientist Linda K. Glover guide the adventure, in consultation with experts from NASA and the National Oceanic and Atmospheric Administration—who welcome the publication of a comprehensive ocean atlas geared to popular readers. The accessible text lays out key concepts, points of interest, and little known facts, opening our eyes to living phenomena from giant squid to tiny microbial bodies. Astonishing full-color photographs and diagrams reveal the beauty and complexity of ocean life. Unprecedented new full spread maps of the ocean floor—hand-drawn by expert cartographers—reveal the five major oceans in astonishing details. An unequaled resource for both education and entertainment, Ocean also explores the progress of fascinating technologies that will help scientists discover uncharted regions and life-forms. In light of recent events—the tsunami of 2004, Katrina and Rita of 2005, the growth of the ozone hole—humankind’s link to the ocean is front and center in our lives today. This rich informative, and timely atlas, encourages understanding of how the ocean correlates with these happenings—and how human maintenance of its waters and creatures will keep the planet going.